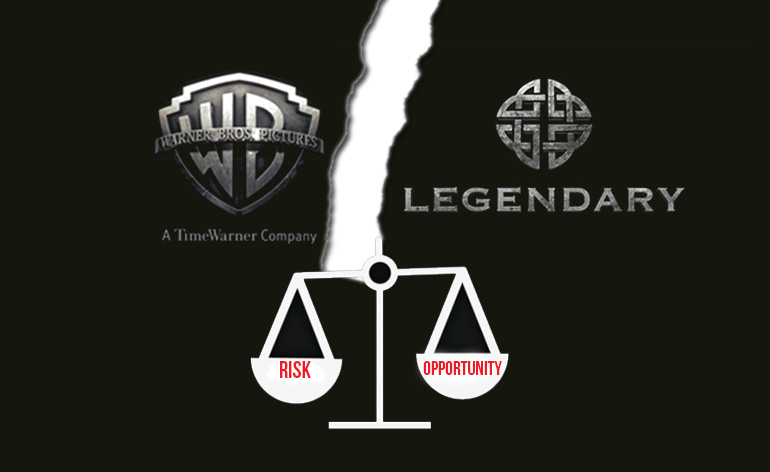 Recently, Legendary decided to not renew their contract with Warner Brothers and signed up with Universal.This left Warner Brothers without a financing and producing partner. However, Warner Brother acted quickly and added Dune Capital as a financing partner. The decision was surely complex, but underneath it all lies a simple economic theory called ‘risk aversion’. If you have raised money for an indie film project, you know that it is a big challenge. It’s not like raising money for any other type of business. Most people think you’re crazy when you ask them for their money, because they might never see it again. Even with kickstarter, it’s very hard to convince people to invest in your projects, dreams, or whatever. Well, your not alone. Even the big studios have to ask for money. In the world of big studios there is no Kickstarter, but there are investors with big pockets. These large investors are usually financiers or production companies such as Legendary, Village Roadshow, Relativity, and others. It might not make sense for studios to get help from outside financiers, because most of the studios are part of larger wealthy conglomerates. For example: Paramount’s parent corporation is Viacom and Warner Brothers belongs to Time Warner. There are few ways around this risk. For example, producing movies based on known material, remakes, franchises, or bringing in partners to share the high risk. So, WB brought in some funding from Dune Capital. This deal will allow WB to use this new cash to finance their slate of upcoming films. Again, rhere are many complex reasons that need to be factored when looking at Legandary’s actions, however we can trace some of it to economic theory. The graph shows different levels of risk aversion. Basically, this means is that all investors have different preferences for risk. Some prefer low risk and invest in dividend-paying stocks such as Microsoft. Other’s prefer more risk but higher return and invest in startups or Hollywood. One way around high risk ventures is to distribute the risk and partner up with other investors who have the same risk aversion (same crazy level). This is specially true for the movie business where the risk is very high. There is no assurance that your movie project will be a succes. The only option is to find partners. So, WB did a smart decision to find financing partners for their upcoming slate. This allows WB to share the high risk associated with its projects. Legendary’s decision can also be traced back to risk aversion. Legendary has mostly financed tentpoles which share the following characteristics: high return opportunity and high risk. It seems that one way to decrease risk is to have more creative input into the projects being financed. Under Universal, Legendary will be allowed to cherry pick and have a more creative voice in their projects. The higher return opportunity comes from the fact that Universal has access to theme parks TV operations, and Comcast’s resources. It seems like legendary will still take on high risk projects. However, successful projects can benefit from Universal’s assets and create even more value.